we really don’t know how lucky we all are yet. it may be too early for most to even recognize the significance of the result of saturday’s champions league final between manchester united and f.c. barcelona. something big was determined at wembley on saturday, and it was bigger than just determining the european champions. many of the debates that rage within the game are purely philosophical in nature. who is better: messi or ronaldo? is joey barton crazy? should there be homegrown player quotas? what’s more important: your club or your country? we can all offer our opinions, but no definitive answers can be drawn from those questions. and we can’t really answer any of those questions because there is no right answer to any of those questions. well, except that it is fact that joey barton is certifiably insane. what gives this game the right to answer a supposedly unanswerable question? let’s start with a few obvious qualifications. this final was a match up between the two most dominant clubs in europe over the last decade. it was united’s third champions league final in the last five years, and barça’s third in the last seven. domestically, both are staggeringly dominant. and since la liga and the premier league have been the undisputed best two leagues in europe during this time frame, it’s even easier to call them both the best when barça have won five and united have won six of the last ten titles in their respective leagues. together, they’ve won four of the last seven european championships, and it would have been five of the last seven if inter hadn’t found a way to sneak past the catalonians in last year’s semifinal. now i know i haven’t been the biggest barcelona supporter in this space. in fact, i’ve been outright harsh on them. but regardless of my complaints about them (mainly the excessive and unneeded diving), i’ve always said that they’re the team to beat. and when they’re running on full cylinders, as they clearly were on saturday evening, they’re impossible to beat. i’ll never claim otherwise. another brilliant messi performance might have helped to cement barça's place in history. the wembley final also had some other key ingredients to answer a question such as which is the best team of this generation. messi, almost unarguably the best player on the planet, logged another inspired performance in a big match. and while much of the spotlight was on the tiny 2-time defending world player of the year, let us not forget that he also had the help of the first and second runners up to the 2010 prize. none of the triumvirate let us down, as all performed breathtakingly. additionally, two of the three best managers in the world were on the benches at wembley stadium. on one side of the ring you have the seasoned and legendary sir alex ferguson (12 premier league titles, two european cups, five FA cups). on the other, the young hotshot pep guardiola (3 la liga titles, and now two european cups). another thing that made this such a key, question-answering event: the american sports audience finally paid attention to the champions league final. people at work were asking me about the match, wanting to know what makes that “zavi” guy so good. hell, the american castle of conservativism, fox, decided broadcasting a proper football match live on their flagship network for the first time was worth the risk of exposing their fans to socialism. of the 40 responses received on the WSOT facebook page, only 9 selected the mancunians to win. so with the world’s best clubs, players, managers and a massive wave of interest behind it, the table was adequately set to decide who was truly the best side of this era. let’s be honest though. it would have taken a massive victory by manchester united to get any of the punditry to hand them the title of “era’s best”. this isn’t the best squad that united have fielded under sir alex (the 1999 treble winners probably were), and the red devils would have had to turn in an epic like an 8-0 win to sway anyone into believing the title of the era’s best belongs to in manchester. but lucky we were again, as barcelona emphatic victory made it all the more easy for us to hand them the crown instead. 68% possesion to united’s 32%. 22 shots to united’s 4, 12 and 1 on frame respectively. 6 corners to united’s 0. 719 completed passes to united’s 301.
unusually for me though, it wasn’t the statistics that really drove home the point. instead, it was the way that barcelona won the match: they did it without all of the theatrics. gone were the ridiculous antics that plagued their semifinal match ups with real madrid, and instead we were left with solely the beautiful game that this team is always lauded for. in fact the only time i even saw busquets grab his face is when he was actually hit in it. it’s just that i feel much better about deeming a team worthy to be called the best of an era when i don’t think they earned it by any form of cheating. and beat united they did without it. simply put, barcelona beat the other best team in europe with style, skill and class. my highly unscientific facebook poll showed that most of us expected that outcome, but that doesn’t mean we didn’t all get more than we expected. 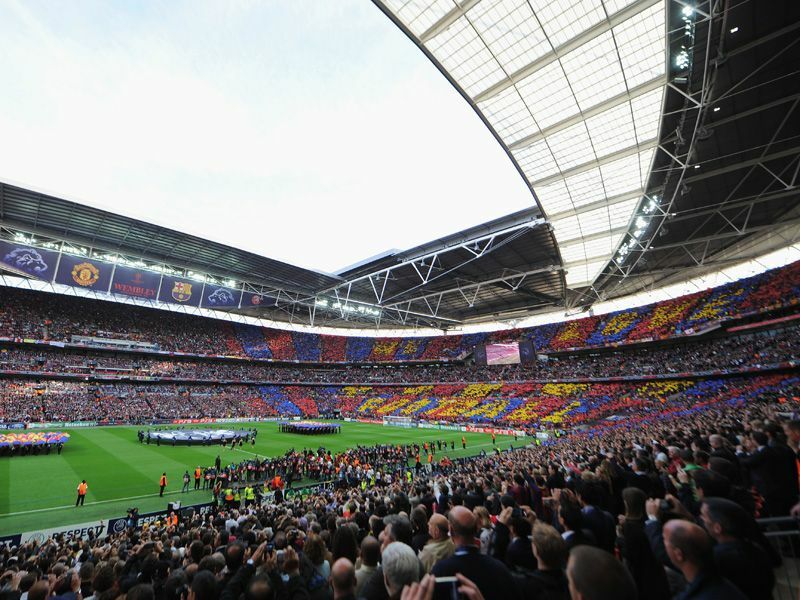 barça proved themselves again, and thanks to it, have written themselves a special chapter in the history of football. and as many generations go by without the opportunity to say that they had watched a truly dominant side. what’s becoming ever more apparent, though, is that saturday… we did.